JIGS → Casting → Jewel 7/16oz Eakin's Jig 2ct. Jewel 7/16oz Eakin's Jig 2ct. 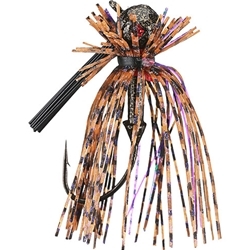 The Jewel Eakin's Jig is a Finesse Jig that has a balance designed to fall flat. Features a custom bend Mustad Ultra Point Black Nickel Hook with Cross Eye, Fiber WeedGuard, and a Chip-Resistant Powder Coat Finish to withstand heavy beatings in cover. The Eakin's Jig has a Hyperflare skirt and a Rattle Band that are sure to catch the attention of any fish. MADE IN THE USA!